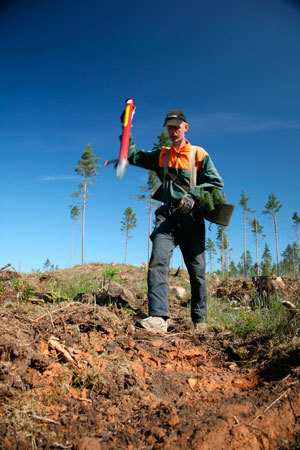 Forests are important to Sweden in several ways. Two thirds of the country’s land surface – or some 28 million hectares - is covered by different types of forests. Of this, some 23 million hectares is considered productive forests. The forest sector’s importance to the national economy is significant. Today, nearly 60 000 persons are directly employed in the country’s forest sector and Sweden is the world’s second largest exporter of pulp, paper and sawn wood products combined. More than 300 000 private individuals own forest land themselves. Family-owned forests represent around 50% of the total forest area and some 60% of the total annual yield. For many other people, the country’s forests are also important - for hunting, for picking berries and mushrooms, for recreation and contemplation. Forests also play a central role in sustainable development. Wood fiber as a raw material is renewable, recyclable and neutral when it comes to emissions of carbon dioxide contributing to climate change. Consequently, forests are gaining increasing attention as a resource in relation to ambitions to mitigate climate change and develop more resource- and energy-efficient societies. The Swedish forest industry’s vision is to be a driver in the development of a so called biobased economy, that is, an economy in which fossil raw material is replaced with renewable and recyclable raw materials such as wood fiber. At the same time, a sustainable society is dependent upon well-functioning forest ecosystems which are able to provide us with services such as climate- and water cycle regulation, and recreational experiences. Therefore, these so called forest eco-system services have to be sustained as well. The basic idea in Swedish forest policy and forestry-model is that forests shall be managed to provide economic, ecologic, as well as social benefits. Efficient and sustainable production of wood for different end-uses shall go hand in hand with preservation of valuable ecological- and socio-cultural values. In Sweden, the multi-functional role of forests is safeguarded through regulations on the use of forests across the entire forest area. In addition, land with significant ecological - or other values is protected or the management of such land is adapted. Exploitation of forest resources has a very long history in Sweden. In earlier times, many forests were overexploited for purposes like logging for domestic timber and fuelwood use, cattle grazing, charcoal production for the mining industry, and latterly logging for sawmill- and pulp industries. By the end of the nineteenth century, large areas of forest had actually been depleted. In order to come to terms with this situation, the Swedish Parliament passed the first Forestry Act in 1903, containing provisions which required land owners to replant after forest felling. The trend of depletion was thus reversed. Since the 1920’s (when forest surveys were first initiated), the total standing volume has increased significantly.